This year has been full of lessons. If you’re not making choices about your life, someone else will make them for you, and If you aren’t living and launching on your own terms, you’re letting someone else define who you are, and how you can be successful. Of course, living and launching on your own terms is both scary and completely disorienting at times, but honestly- I wouldn’t have it any other way. I have two big announcements- both of which caused me a lot of anxiety of the last two months, but it has all come full circle. I have had an entrepreneurial spirit my whole life, and have found in my own meandering experience that the best ideas are often the craziest ones, or at least, the ideas that are truly genuine to who you are, and, in my case, that authenticity is a little bit crazy. Throw more pink on it, and dip it in glitter- those are Shannyn-esque ideas. This was seriously, a crazy idea. It was super scary to start, but pink glitter pug medals seems to make sense now! First, the Virtual Pug Run was an idea I had last year to help fundraise for the Northern Illinois Pug Rescue. I had fostered and adopted three pugs (one of which is now deceased due to cancer and a second is with my ex, who is spoiled rotten and very happy), and had previously tried to fundraise by selling blog ads, blog coaching and even selling off my old handbags on Ebay, with very little success. Begging for support, also, did not work really effectively. When I first ran the idea of a Virtual Pug Run to my friends on Facebook- I had an idea that the medals would compel people to participate, and honestly- when you make charity a win-win, people get excited. What I didn’t anticipate was the amount of naysayer feedback- namely, that people should give, just to give. I believe that people are good at heart and want to help rescue pugs, but simply begging for support via email, Facebook and by selling off my stuff was only raising a few hundred dollars at best. Trying to beg for support was both frustrating and totally unfun. 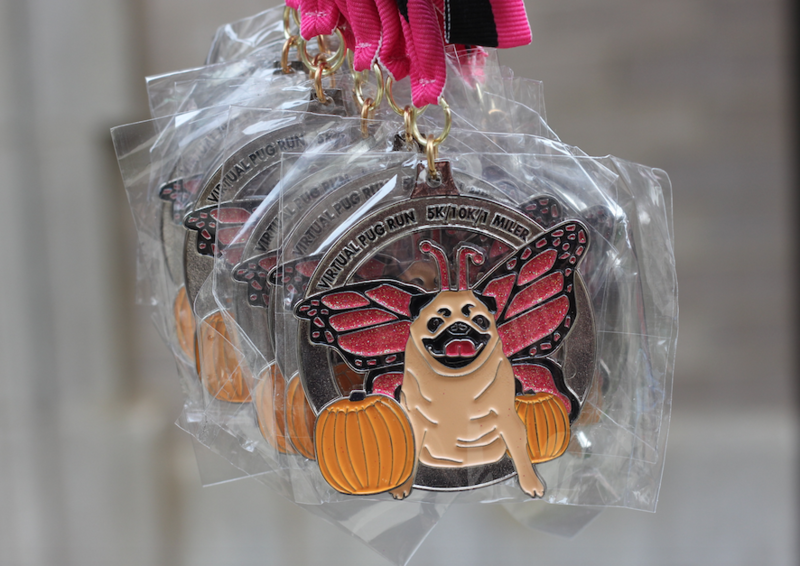 Fundraising is about raising funds, but I started to pay more attention to the “fun” part in fundraising, and despite the naysayers who hung to the belief that begging would be effective, I improvised an incentive… glittery pug medals, and really high quality pug medals at that. I decided to trust my gut- I didn’t think there was anything wrong about throwing some swag into the mix, though some people, very vocally so, thought that my approach to fundraising defeated the purpose. In their minds, if a person was donating money, part of which went to the swag and not the cause- it would be pointless, it *all* should go to the cause. Too bad though that I’d tried that before and only raised $330. Sometimes, you have to spend money to raise money, and I was willing to take a leap of faith. I whipped out my credit card and ordered medals on faith. We sold 344 last year and raised $8,176. We have over 475 Virtual Pug Runners this year. Sometimes, crazy ideas are the best ideas. This year, I took an even bigger leap of faith and nearly wanted to vomit when I committed to growing the order from last year, and placing the order a month early without the registrations in hand. I placed the medal order after only having hit 100 registrations, and knew that if people didn’t like puggerflies, I’d easily lose over $1,000 of my own money. I threw myself into fundraising this year- I tried new tactics, including Facebook ads and reaching out to a few “pug celebrities” on Facebook. My amazing friends and blogger networks stepped in to tout the message, and I prayed the awesome pug medals would get people to actually sign up. My friends and fellow bloggers went to bat for me, and I didn’t want to let them down with a failed fundraisier. 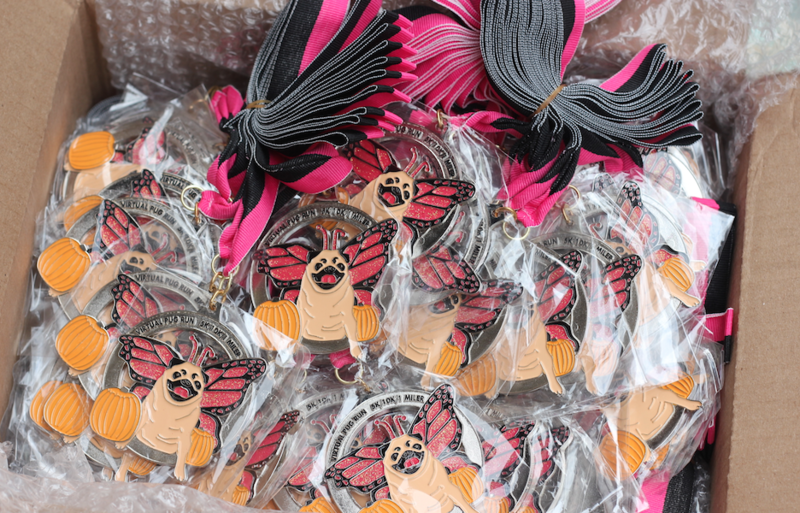 Here we are, one day before the fundraising deadline, and I sit here with three very heavy boxes of gorgeous puggerfly medals. We are completely sold out, ahead of schedule. Today, hit our fundraising goal of $9,500 (plus more with cash donations that I’m tallying up)! I am humbled, grateful, and a little bit nervous about how long it will take to package up nearly 500 bubble mailers. Saying I was scared to do the Pug Run this year would be an understatement. Just because last year went well, what if this year had flopped? What would I do with over $1000 in unused pug medals? Would I be totally embarrassed? I had a lot of self-talk going through my head, I’m really glad I didn’t listen. I had to tell myself, SEVERAL times in the first few weeks, that failure is okay, but not trying at all is unacceptable. The second big announcement is also in the same vein as the first- I just relaunched my social media consulting & management services at CakeMixMedia.com! Launching my own business was also a huge leap of faith, monetarily and personally. 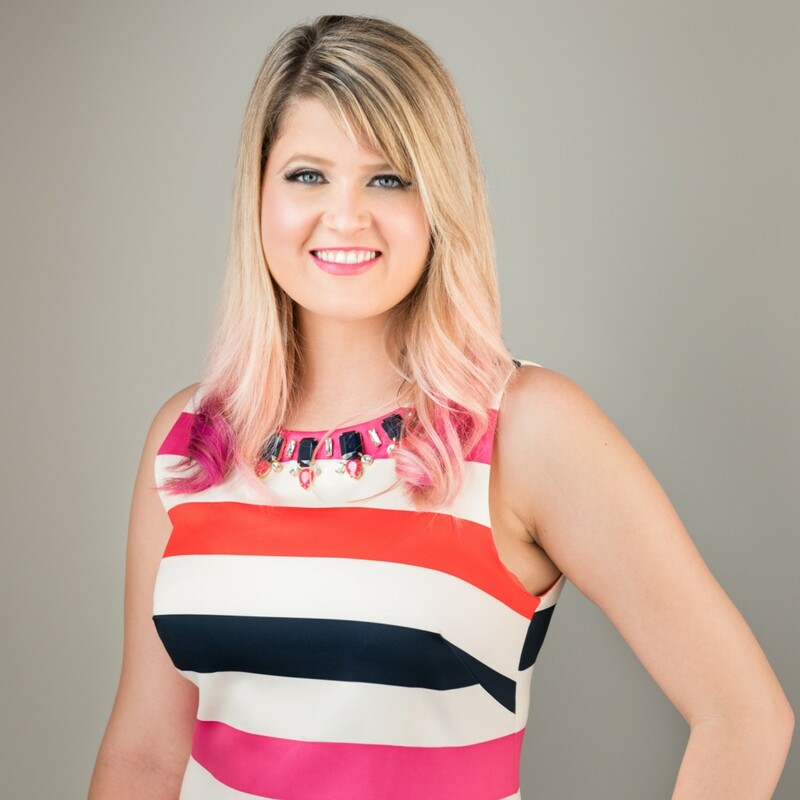 It’s been a nail biter for sure, but I believe in the work I do, and I absolutely love the clients I serve- it was time to invest in a website that had a bit more polish and represented who I am…and my new pink hair. An old website just wasn’t going to cut it! When I got laid off in May, I had to fly for awhile on blogging and coaching income alone. I took a few frugal trips to sort out where I wanted to go next with my life and do some serious soul searching. I was pretty upbeat about the whole thing, but it amazes me how doubt can creep into your mind and permeate all that you do. The best way to cure it, is to simply take action, and forward momentum builds your confidence. I decided to invest in myself and completely overhaul the website, which was a lofty financial investment. I ordered new business cards, new headshots, and I had some brand new expenses to take care of (like more website hosting, accounting fees and oh yes, health insurance- fun times!). Yup, it’s not cheap to be a free bird. I now stand, humbly in front of a brand new relaunched business, at the same place of uncertainty that I did when I launched the Virtual Pug Run, though a lot more is on the line than just my pride and an extra $1000 to lose on medals- my reputation, my resume and quite frankly, my livelihood is now out there, in the ether, trying to become something greater. New head shots & a new rebranded business at CakeMix Media! I have spent a grand part of my life wishing I was something different- a more traditional leader, more left brained than right brained, a corporate climber or simply someone who had invented the next big iPhone app that made a gazillion dollars in a matter of months. The thing is, as I get older, I’m leaning into more of who I am and especially, who I am not, to help me serve others more effectively. Honestly, I feel grateful that a lot of it involves pink, glitter and good causes. It’s a career on my terms. It doesn’t look like I thought it would- but the things I used to think were silly are truly impactful. 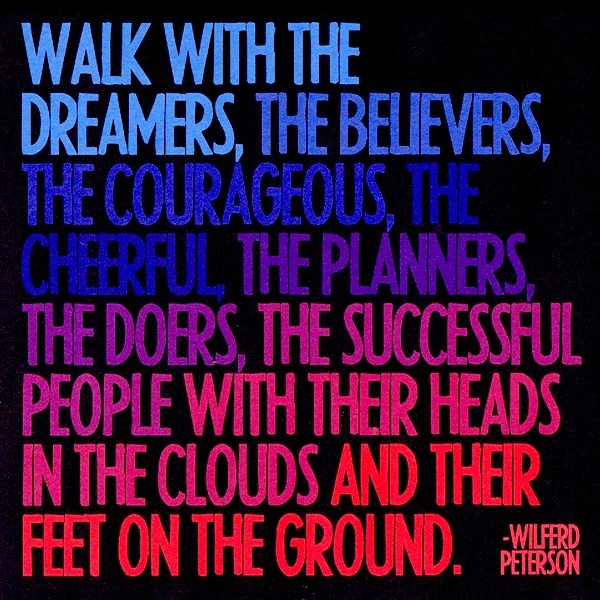 I am grateful I can have both a career, and effect serious change, without being so well…serious. Going forward, I take my work very seriously, but it doesn’t have to fit the suit and tie, startup junkie mentality it used to. A little pink and a little glitter can change the world, and I seriously hope to do that in both my philanthropic and career endeavors in the rest of 2015. I sincerely thank you for supporting the Virtual Pug Run, your shares and sign ups made it a success. Now, if you’re so inclined, I humbly ask for your support as I build my own social media and consulting business at CakeMix Media. Give me a follow? 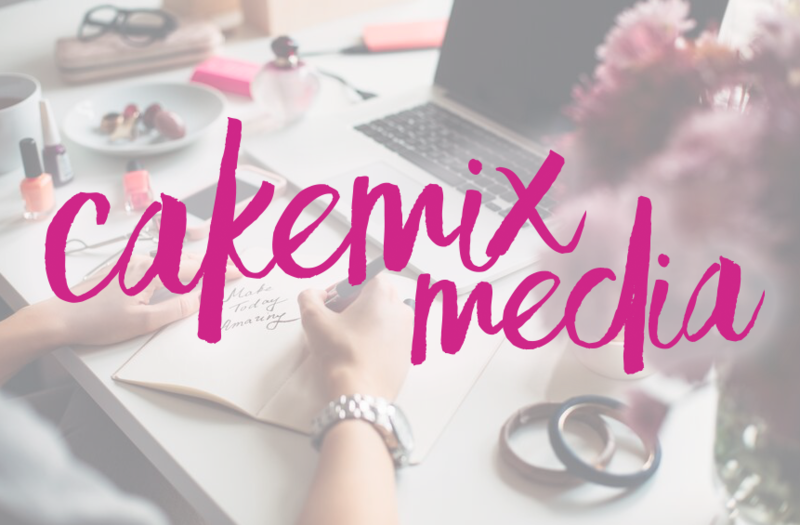 Following CakeMix on Instagram, Pinterest, Facebook & Twitter is hugely appreciated, and I promise not to post junk- it’s all professional, social media, women’s business and philanthropy topics! Know any businesses who need my services? Right now, I’m looking for referrals of small to medium-sized businesses who believe in the power of social storytelling and digital influence and need help strategizing or outsourcing their social media marketing and customer care. While the packages are a bit high-scale to handle several platforms and complete content, copywriting and analytic needs, I also offer hourly consulting and smaller packages for businesses of all sizes who need help managing and strategizing their social media marketing. Again, thank you for supporting my crazy dreams and my big endeavors. This blog has been my life and project for five years now, and I’m rooted in the spirit that I had so much help and support along the way. Now, I hope to pay it forward. Sincerely, thank you. 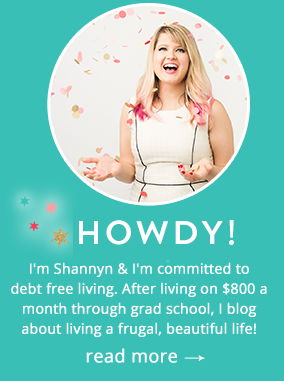 Congratulations on these two HUGE developments, Shannyn! I bet you are doing a happy dance today! I will give your new business a follow on Facebook and Pinterest for sure. Woot! Good for you for making your dreams a reality!! Congratulations on all your success! You deserve it!! Your site looks very nice! I may actually have a client already I can send your way – I’ll let you know in the next couple of weeks. I am a freelance graphic designer and after redesigning brands for clients they generally want me to handle their social media – but that isn’t really my area, outside of designing the images for them. Maybe we can pass some business back and forth? 🙂 My freelance site is astarkdesign.com if you ever need design work! How exciting!! And what an encouraging story about the virtual pug run. I don’t understand the people who say that you should give money because you want to – not because you get something in return. But really, companies like Tom’s and any fundraising race are doing well because there is an incentive to giving (although in an ideal world, of course people would give just to give – but that’s not the most effective in the real world, as shown through your example!). Thanks! Regardless, there’s an emotional incentive to give as most people feel good about themselves afterward. I’m just a fan of adding some glitter in the mix! Followed 🙂 So psyched for you and will absolutely keep you at the top of my list for referrals!! Thanks Stefanie, you know I appreciate all the support! I hope you realize what an inspiration you are! As someone who is still fairly new to the blogging world (just over a year now, I still consider that new!) and would love to one day work for myself, you make me believe that someday that could come true. It seems like you never take no from an answer, whether it’s others saying it, or your own mind! I just recently discovered virtual runs and have started doing some. I like that I’m contributing to charity, but medals are a huge reason why I pick the ones I do. I was hoping to sign up for yours, unfortunately my budget was too tight to be able to. Count me in next year! Aw, thank you! If you set your sights on self-employment, I’m sure you can make it happen. So many others have, and I’m grateful to be among them. Great to hear that! I’m glad you didn’t compromise your budget- totally understand! Wowza, that’s a lot of pug money! Congrats! And good luck with your business. I *love* the name CakeMixMedia. You’re absolutely right, if you don’t write your story, someone else will and you can bet, you’ll be a peripheral character in their story. Much better to be the central character in your own. Following your gut, in my experience, usually pays off. It’s when you don’t listen that things tend to go wrong. Good luck with your new ventures. Thank you! Following your gut can be difficult, but it pays off even if it’s scary! You’re such an inspiration! Congratulations on reaching your fundraising goals as well as launching your new business. You’re on a roll! Kudos to you for standing up for what you believe in and not letting the naysayers hold you back. Thank you, that means a lot! I hope I can set a good example for everyone else wanting to take this path. I know from experience sometimes naysayers can rob the joy of fundraising but I admire your positive attitude. Congratulations on all your success and I’m happy to follow CakeMix Media on all social platforms! I was previously a dog-walker in England, and I was lucky enough to walk 4 pugs. Out of all the dogs I walked you’d probably not be surprised to know they were my favourite! I am so very behind the awesomeness of the pug-run! And congratulations on CakeMix, I love the name, happy to share on twitter!